St. Peter’s Square With Solar Dishes, Photo Montage by Robert Lundahl ©2015. In the weeks preceding the Joshua Tree premiere of the film, Who Are My People? http://whoaremypeople.com, I arose at 5:00 a.m. to work with a remarkable person. Pat Flanagan, self described “74 year old grandmother” was obsessed. As a board member of the Morongo Basin Conservation Association, she had labored for many months studying the permitting documents for the giant Palen concentrating solar plant. It was to be located at the southeast corner of the much beloved Joshua Tree National Park. The Palen plant was to have twin towers, similar to the Ivanpah Solar Electric Generating System, located 15 miles outside Las Vegas. Tribal groups objected to the location of the Palen facility due to its proximity to cultural sites like Corn Springs, an ancient site characterized by a large wall of petroglyphs, and because of the visual impairment to desert landscapes. Three large solar facilities had been constructed in the Mojave Desert as a whole, and neither residents nor tribes were happy. These multi-billion dollar investments had drawn lawsuits from groups like La Cuna de Aztlán Sacred Sites Protection Circle, the Quechan Tribe, and others. Palen would likely be in violation of several laws protecting Native American patrimony and religious freedoms, including the American Indian Religious Freedom Act (AIRFA). If traditional ceremonies were held in the area, the presence of twin industrial towers would not be conducive to those practices. Palen also had the distinction of being turned down by the California Energy Commission, State licensing body for such projects. But like a vampire, it had arisen from the grave in a different form, a single, larger tower with a giant solar receiver atop. What had begun to obsess Pat was that the documents provided by the State CEC and the federal BLM (Bureau of Land Management) did not match in their descriptions. Pat had written the Federal Aviation Administration to ensure the tall towers, now single, were not a threat to aircraft. The state and federal assessments had described two very different structures, and the language of the descriptions themselves further confused the matter. The Bureau of Land Management Draft Environmental Impact Statement described and analyzed a 750-foot tower including a 68-foot high solar receiver. The CEC Palen Solar Power Project-Compliance Document, dated 9/12/2014 described a 130 foot glowing solar receiver with four times the volume of the federal version. Basin and Range Watch suggested that the instrument would have 3.8 times the killing flux volume of Ivanpah, which had, by that time, been excoriated in the press for killing the birds of the Pacific Flyway, along with resident endangered species like the Yuma Clapper Rail. Moai Giants, Easter Island (Rapa Nui), with Solar Concentrators. Photo Montage, Robert Lundahl. Pat had found, using Adobe search functions on the 1000 page .pdf documents, that the height of the receiver was not mentioned until page 997. Why? The use of the word “atop”, did not clarify. In stating the tower height at 750 feet with a 130 ft. solar receiver “atop”, the question remained open as to whether to combined height of the tower and receiver in the State documents would be 750 feet cumulative, or 880 feet cumulative. The call to the federal aviation administration eventually returned the information that the height of the tower was to be 750 feet. The height of the solar receiver would be 130 feet, and the cumulative height would be 750 feet. But this did not explain why the documents suggested otherwise grammatically. Was it simply a misuse of language, bad grammar, copied from project to project, document to document, originating with project applicant BrightSource at Ivanpah, three years earlier, passed through the system without adequate editorial review by the State in a haste? I had been engaged by CAre (Californians for Renewable Energy) some years before, to help write a legal complaint targeting the Department of the Interior, the Department of Energy, and six of the first 10 project applicant companies in California. CAre, along with La Cuna de Aztlán Sacred Sites Protection Circle (founded by 80 year old Chemehuevi Cultural Monitor, Alfredo Figueroa), and six Native American elders, would be litigants. Ivanpah was a named project in the complaint, and BrightSource along with other companies, had joined the suit to oppose it. The case, still in court, is being heard today, April 10, 2015, in the 9th Circuit Court of Appeals in Pasadena, California. My company had written press releases, managed press inquiries, provided communications outreach to news organizations around the world, engaged the Wall Street investor community, and made “Rapid Response” videos to show destruction of Native American antiquities in real time, on the ground. It was a public relations operation of impressive scale and effectiveness. I was Alfredo Figueroa’s, PR machine. Engaging with Pat Flanagan, and aware of her track record as a researcher, Biologist, Ecologist, educator, and the first biological monitor at the Solar 1 project in Daggett, California, the “grandfather” of power towers, and predecessor to Ivanpah and Palen, I was aware Pat was uniquely qualified and motivated to hold project applicants and governments accountable. 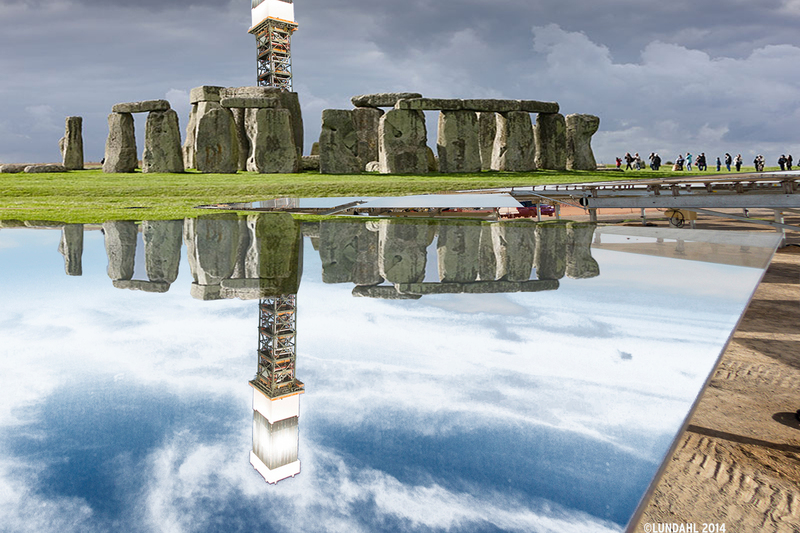 BrightSource, Stonehenge. Photo Montage, Robert Lundahl. John Dayberry, also an educator, from the Lake Tahoe area, weighed in. In order to communicate more broadly with the public, and specifically with youth, he suggested, use visuals. Photoshop skills and a Bauhaus-style class in Photo Montage inspired me to take his suggestion seriously. 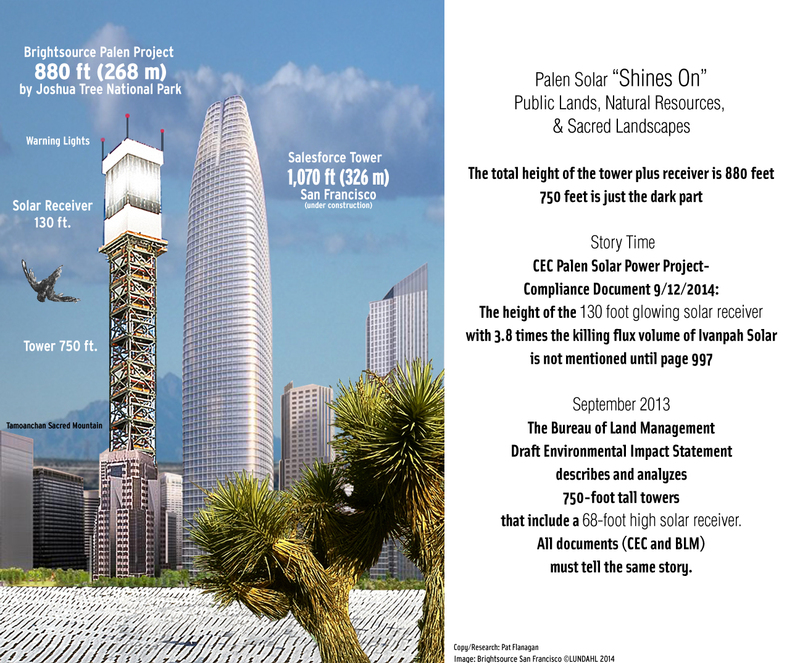 Finally, Pat suggested we show the presumed 880 ft. tower and relate its height to the tallest building in San Francisco. Better yet, let’s put San Francisco in the desert, I opined, in front of the sacred mountain, Tamoanchan, where Chemehuevi Cultural Monitor, Alfredo Figueroa says his people descended from the stars. The image was startling, the juxtaposition strong. A “streamer,” a dead bird hurtling toward the ground, is seen in the photo montage. An accompanying graphic refers to the conflicting BLM and CEC documentation and gives the height of the tower at 880 feet. We knew the official response was that it was not, but to say that it was made the presentation more dramatic. Docketed Approval Document Indicates Project Tower 120’ Lower Than In Actuality, According to CEC (California Energy Commission). Was it “wrong?” I simply chose to interpret the usage of the word “atop” differently than the agencies told us they did, and “take them at their word”, as the specific grammatical construction appearing on the CEC docs suggested, assuming it was correct. A second email “blast”, titled “A Post-Modern dilemma: How can we have so much information and learn so little?” was released the next day. BrightSource San Francisco, Photo Montage by Robert Lundahl. Leaks are a fact of life. Fact is, this e-blast was deliberately and openly leaked to energy company representatives. The following Friday, Pat uploaded her report, on Morongo Basin Conservation Association letterhead, to the public comments section of the California Energy Commission Palen Project portal. Later that day, the Palen Project, which had caused so much heartache and anguish in the Joshua Tree community was withdrawn. CEQA, the California Environmental Quality Act requires clear and unequivocal communication with the public. “The agencies were caught with their pants down, with inconsistencies in the notation of the size and dimensions of the solar receiver, the “Killing Flux” and safety impacts. The discrepancies in the reporting were documented by Pat Flanagan and correlated by she and I over the last few weeks. There was a consistent stream of public relations activity beginning with the film screening in Joshua Tree (“Who Are My People?”) and continuing with sarcastic Twitter and Facebook campaigns (“Brightsource, Stonehenge” and the others) mobilizing the Joshua Tree community and exposing the crisis to hundreds of people. Outgoing Superintendent Marc Butler of JTNP, 2 days after the screening, came out in an OpEd in the Desert Sun newspaper describing the project as an existential threat to the Park. What happened with Solar Millennium, Blythe (Project) and Rio Mesa, happened again. Just as the company reached a point of confusion about project profitability, and began to run out of time to receive their cash grants, which would have required certain construction activities to have been completed, the public intervened, sowing “Fear, Uncertainty, and Doubt,” an old trick in the field of competitive PR. Keep in mind it is hard for one corporation or organization to communicate internally. We had three, the CEC and the BLM, and the applicant, BrightSource, trying to get their facts straight, trying to work together, all following the denial of the project, its restatement, and “scale back” to one tower. Not suprisingly, their work was slipshod. Words are important.